FALLON, Nevada - The "Eagles" of Strike Fighter Squadron (VFA) 115 completed the Strike Fighter Advanced Readiness Program (SFARP) training syllabus at Naval Air Station (NAS) Fallon, Nevada, March 23. SFARP is a unit-level training program intended to maximize the tactical proficiency of strike fighter aircrews across the full spectrum of F/A-18 mission sets by using academic lectures, simulator events, and tactical training sorties. "Completing SFARP has been a tremendously valuable experience for our pilots," stated Lt. David Ash, assistant detachment officer in charge for the Eagles. "The syllabus required everyone to rise to the challenge and achieve very high levels of tactical knowledge and performance in missions that ranged from urban close air support to offensive counter air." 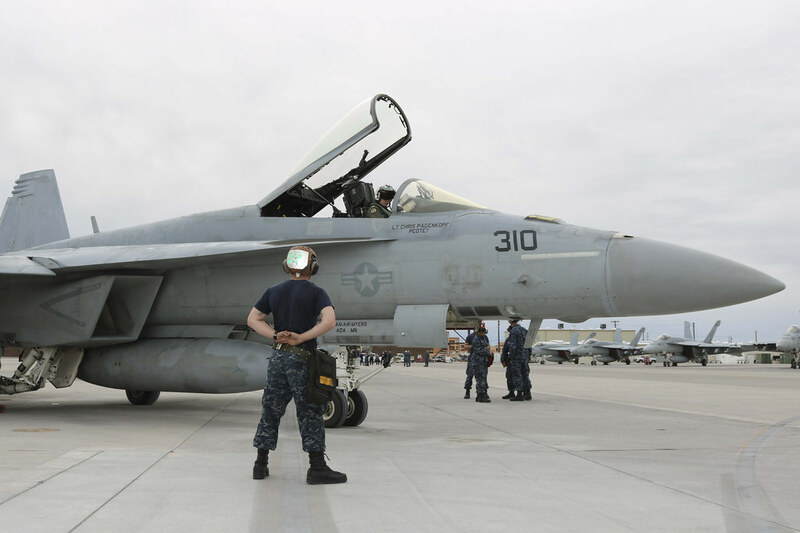 VFA-115 began SFARP on January 29 at their forward deployed home of Naval Air Facility (NAF) Atsugi, Japan, under the instruction of Strike Fighter Tactics Instructors (SFTIs) assigned to Strike Fighter Weapons School Pacific. In Atsugi, the Eagles completed mission planning labs, lectures, simulator events, and the initial air-to-air training flights of the SFARP syllabus in their local working areas. The squadron shifted to NAS Fallon at the end of February, flying eight aircraft across the Pacific to take advantage of the unique training opportunities offered by the Fallon Range Training Complex (FRTC). In Fallon, VFA-115 pilots were evaluated by SFTIs from Strike Fighter Weapons School Atlantic and received adversary support from the "Fighting Omars" of Fighter Composite Squadron (VFC) 12 and the "Fighting Saints" of Fighter Composite Squadron (VFC) 13. "The ranges and adversary support in Fallon were absolutely fantastic," said Lt. Jesse Kasper, detachment officer in charge. "After four weeks of high-tempo SFARP training operations in the FRTC, we can be confident that we are returning to Atsugi at the highest possible level of tactical readiness for any contingency in the Indo-Asia-Pacific region." In total, the Eagles expended 74,879 pounds of ordnance during SFARP. 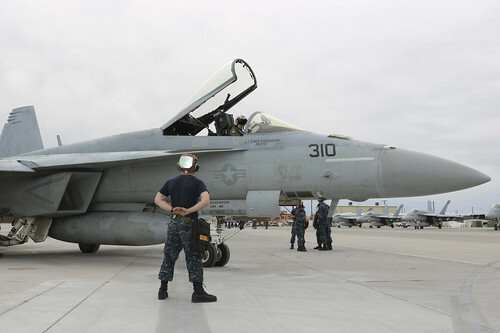 VFA-115 also participated in a missile shoot exercise, March 3-4, at the Point Mugu Sea Range, which resulted in the successful launch of one AGM-88 HARM, one AIM-120 AMRAAM, and two AIM-9 Sidewinders. VFA-115 is currently forward-deployed to NAF Atsugi, Japan, as a component of Carrier Air Wing 5, and regularly embarks the Nimitz-class aircraft carrier USS Ronald Reagan (CVN 76) in support of security and stability throughout the Indo-Asia-Pacific region. USS John C. Stennis earns Pacific carrier Battle "E"